Yeshua, has been the world’s best kept secret. I was surprised to read a scripture that I had read many times before today. It is the one found which says that Yeshua was about to be stoned by the Pharisee and in the middle of that he hid himself and walked right out of there in the midst of them without them seeing him, and I note that he can hide himself because he is spirit. Yeshua is all God plus flesh so wouldn’t it be fair to say that he can hide himself; hence we see that flesh should not be an obstacle when we have God’s spirit within us. In the case of the Pharisee (flesh) and Yeshua (Spirit) one can see value. There is not a time that Spirit doesn’t win over flesh. The Samaritan woman met God at the well. This thing is about truth in the natural mind we can see that we see using tools; or what we do as receiving truth, Some are under the false ideal that what we think or see in our minds can be used to gain salvation. Hence, I can say I believe, but in reality is that all needed? Many people are under the impression that walking the aisle to take a seat in the front of the church earns salvation.Moreover, others believe that to take the right hand of fellowship with the Pastor gives salvation, and there are still many who believe their working in the various ministries mean salvation. The only tools needed to hear are ears which allows for a change in thinking. How? The woman meets Yeshua and to her he was a stranger, and he strikes up a conversation while she attempts to draw her water; he asks for a drink. She says that he has no (tool) which a wordly thought, but still a sound one because no one can go deep without a tool, and she reminds him that he has not such a tool. Spiritual always wins over flesh. Yeshua tells her if she drinks the Living Water he brings to her she will never thirst again. The woman being carnal believes that she can have the water, although she hasn’t changed her living condition. Most of us think this way because we have been trained that if we sing, preach, shout, talk the best scriptures that this will change our life. We have no ears to hear, and thus are undelivered. Yeshua tells the woman after she asks for the water to go get her husband and this was a place of decision for her, because had she not admitted that the man was not her husband her condition would not have changed; that is her hearing would not be opened. Spirit always wins over flesh. We must get that there are no fleshly, carnal tools to open our ears to hearing. Yeshua tells the woman every single thing about her, and she believes. She didn’t know his name, she didn’t mind that he knew her business. In fact she was elated that she could get that thing out in the open. Spirit always wins over flesh. We know that the woman ran off to tell everyone she knows that Yeshua has living water. The devil doesn’t want dark deeds in the open, because this means that we will realize our need and confess them for healing. There is no way in carnal thinking to be changed from unrighteous to righteous, except upon hearing truth about ourselves. The only people who will receive truth are those who can hear and that being those who admit that they are imperfect. Flesh cannot win over Spirit. So if we are hiding sin then what does this say; there is no truth, we are carnal and living a lie. Many are called to the well of life, but few hear the call. Are you the one? 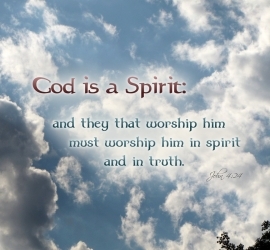 Surely we can’t worship God without his Spirit or without his truth. He who has ears to hear let him use them. This entry was posted in Adolescence, Children, Community, Culture, Double Homicide, Ethical, Family, Marriage, Men issues, Personal, Relationships, Religion and Spirituality, Women Issues and tagged Christ, Christianity, God, Jesus, John, Messiah, Pharisee, Yah, Yahweh, Yeshua. Bookmark the permalink.